The ETCON WS144 Wire Sorter quickly sorts up to 30 wires at a time WITHOUT REQUIRING A KNOWN GROUND PATH. The WS144 makes sorting a one-person operation. Attach the numbered leads to one end of de-energized wires. Attach identifier unit leads at opposite end to receive immediate LCD display of wire number. WS144 sorts up to 30 wires with no known ground path. Maximum wire length based on 250 ohm maximum load: 24 awg 1 mile, 12 awg 14.9 miles. Field replaceable 9 volt alkaline batteries. Operating temperature 0°C - 40°C (32°F - 104°F). Open circuit and short circuit indication. 1-15 leads, carrying case and operators manual. 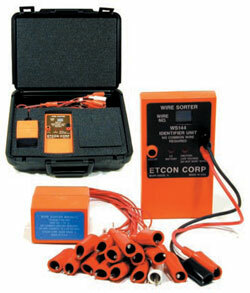 WS144-30 remote unit for wires 16-30.